Bright clouds of methane drifting across Saturn's largest moon, Titan. 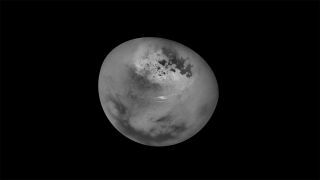 NASA's Cassini spacecraft has captured time-lapse video of methane clouds scudding through the skies of Titan, Saturn's largest moon. "Most prominent are long cloud streaks that lie between 49 and 55 degrees north latitude," NASA officials wrote in a statement. "While the general region of cloud activity is persistent over the course of the observation, individual streaks appear to develop, then fade. These clouds are measured to move at a speed of about 14 to 22 miles per hour [23 to 35 km/h]." The video also shows smaller, more transient clouds farther north, near the complex of liquid-hydrocarbon lakes and seas that lie near Titan's north pole. These clouds move at just 1 mph (1.6 km/h) or so and dissipate over the course of the 11 hours, NASA officials wrote. Days are now getting longer in Titan's northern hemisphere; summer will officially come to the region in May 2017. Cassini mission scientists had expected to observe more cloud activity as spring shifts into summer; Titans' relatively clear skies suggest "that the current understanding of the giant moon's changing seasons is incomplete," NASA officials wrote in the same statement. At 3,200 miles (5,150 kilometers) wide, Titan is the second-largest moon in the solar system; only the Jovian satellite Ganymede is bigger. Titan is the only celestial object besides Earth known to harbor bodies of stable liquid on its surface — though, as noted above, Titan's seas and lakes are full of hydrocarbons such as ethane rather than water. If life-forms swim around in these lakes and seas, they would probably be very different from Earth organisms, which are dependent on water, astrobiologists have said. The $3.2 billion Cassini-Huygens mission — a joint effort of NASA, the European Space Agency and the Italian Space Agency — launched in 1997 and arrived in the Saturn system in 2004. In January 2005, the mission's piggyback Huygens lander became the first probe ever to touch down on Titan. Huygens operated briefly on the huge moon's frigid surface and beamed home images of the alien landscape. The Cassini mothership, meanwhile, has continued orbiting Saturn and studying the giant planet, its famous ring system and its many moons. Cassini will continue this work until September 2017, when it ends its life with an intentional death dive into Saturn's atmosphere — a maneuver designed to ensure that the mission doesn't contaminate Titan or Enceladus, another potentially life-hosting moon, with Earth microbes.